Day 1 got off to a great start, but how has teaching, learning, sports, music and everything else that takes place in a high school been impacted by the move? What were daily challenges? What went as planned? What didn’t? 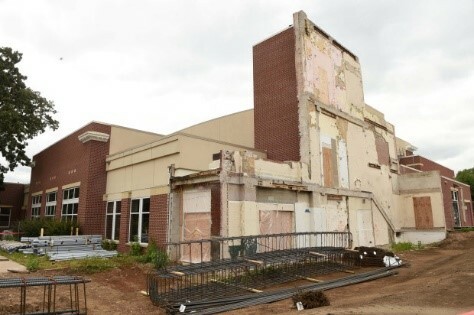 This month’s blog explores these questions along with following the progress of the demolition and the rebuild in preparation for returning to 3100 West River Parkway for the first day of school in August 2019. Newly refurbished, the Upper School at the Mendota Heights location was able to accommodate all aspects of traditional school life – although there were some accommodations. Courses ran as scheduled. The only change was a slight modification to physical education. The construction firm, along with the design team, created a fitness center from 3 classrooms. It was decided that students would use the fitness center for physical education and were instructed to complete their health class requirement until they had access to gym facilities. Lifetime Fitness loaned them the equipment for the fitness center. Music and Fine Arts programs continued to operate as normal with only slight scheduling challenges for room sharing. Due to the limited “social” space and that there were no athletic/sports activities at the Mendota campus, most students leave school once courses are done for the day. This is different from before when students would be in the buildings late into the evening. The sports teams performed with very little impact from the alternate practice locations and playing all “away” games in 2017-18. The boys’ 2018 basketball team won the Basketball State Championship for the second year in a row despite having no home games and practicing in different gyms around the area. They had shirts made that said, “No Gym, No Problem”. 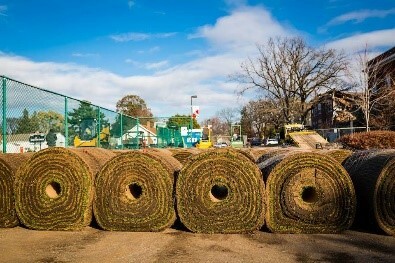 It was announced on Nov. 8, 2017, that the glass contaminated grass on the soccer field had been stripped away and new sod was installed. This was the only certain way of making sure the glass was gone. The field was in service for spring sports activities (spring 2018). Summer 2018 brought new tennis courts. The old courts were on land that is now part of the new classroom buildings. By moving the tennis courts to the area by the football field at the Lower/Middle School, there are now a total of 7 tennis courts (2 more than before). By fall 2018, all sports teams were able to use the gymnasium at the Upper School campus. Senior Grace Percich is amazed the school feels like home. "I've been very impressed with how well this facility has functioned in terms of the planning that was given was so rushed. I think we've been very fortunate," she said. But it is missing some things, like practice fields and basketball courts. There are fewer quiet areas and spaces they can make their own — such as the hallway seniors always decorated. The building is also smaller — meaning there's some creativity in play. Percich pointed out the "chapelteria." "We eat in there, we have all our chapel services, and in addition we have our activity periods. It is used in every capacity, I believe," Percich said. Upper School principal Jason Wenschlag shared that after the busyness in August 2017 with finding an alternate school location, getting it up and running, and beginning the school year, individual administrators, staff, teachers, and students struggled emotionally with the loss of the school itself. Students were also grieving – especially those who were juniors and seniors. They missed the social aspects of their school, the ease of participation in after school programs, athletics being “home”, and just struggling with the fact that school life was different. It is also important to not underestimate the impact of change. Principal Jason Wenschlag shared that the new location impacted getting some teachers’ travel and schedule getting their own kids to school. The classrooms, while newer and nicer, were different. No one complained but change does have an impact and they weighed on people even if it was for a short while. One unexpected positive impact was with the connectedness of people – especially teachers. With the smaller school building and with all classrooms sharing one hallway, everyone ran into one another all the time. People were much less isolated compared to the old building. This created a community feel and contributed to a lot of healing. While at times people felt that they were a bit on top of one another, the closeness may have helped with some of the emotional recovery. The biggest impact to many continued to be the loss of staff members Ruth Berg and John Carlson who died in the explosion. Those who were close to Ruth in the offices where she served as an administrative assistant missed her and struggled with understanding her death. Long time custodian John Carlson was especially missed by his friends who managed facilities and fellow custodians. These losses would hit them at unexpected moments. In addition to those losses, some of the leadership team were injured in the explosion and continued dealing with those injuries. Several suffered from the after effects of concussions and one had significant impact to his hearing. Grief showed itself in different ways. There were unexpected triggers – especially in the first six months. With the Mendota Heights campus having been newly remodeled space just weeks before and with the day-to-day needs managed by the leasing company, the facilities staff had to reconsider roles and responsibilities. The temporary campus did not need as many custodians as it was a smaller space and being new it didn’t require as much cleaning. Their time was now split between the three locations: the Lower/Middle School campus, the Mendota Heights campus, and the Upper School. During the months of September – November they focused on working with the contractors to prepare for the buildings to be torn down. The structures such as the gymnasium, chapel, and music areas needed to be prepared to be separated from the destroyed buildings and items needed to be removed and stored. Once the demolition began in December 2017 they then needed to be available to work closely with the construction team and architects. 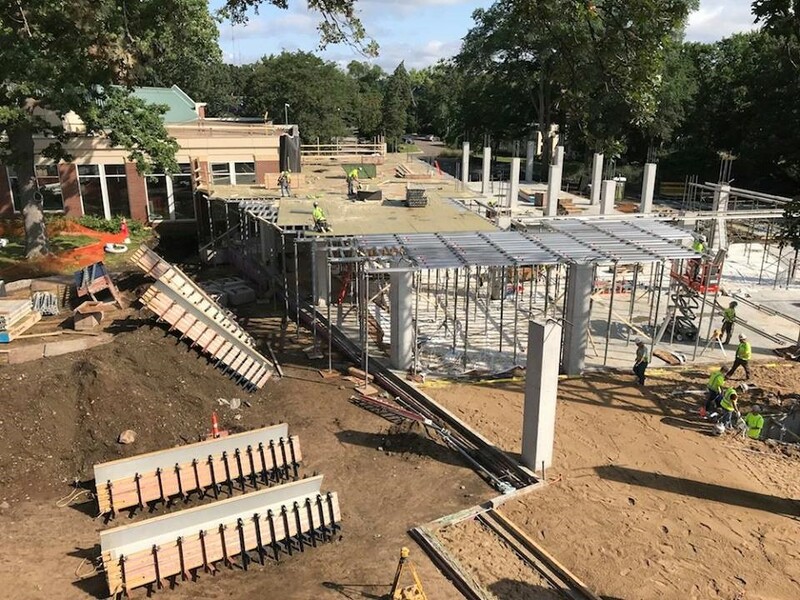 Funding the construction costs required some negotiation, as like most insurance policies, Minnehaha Academy’s was written to rebuild what was lost and replace what was there before the explosion. The buildings that were destroyed were very traditional classroom buildings constructed in 1912 and 1922. It was not the vision of Minnehaha leadership to build new to match what had been. And like most insurance companies, the value determined by them was not in line with the school’s determination of value. To come to an agreement required a negotiation. An additional challenge faced by the school is the fact that the National Transportation and Safety Board (NTSB) has still (as of February 7, 2019) not released its report as to cause of the explosion. While it will not assign fault, it will be the basis for any expected lawsuit against the gas company to meet the school’s growing financial needs. The school could not wait to rebuild and so it had to begin fund-raising to try and close the gap between insurance proceeds and the true cost of the rebuild while also running two campuses and rebuilding the third. Year 2 after the explosion continued to be a very busy time for all. An ironic coincidence is that both the school and the gas company are insured by the same insurance company. After some slight delays due to inclement weather, demolition began on December 14, 2017. When planning for the rebuild of the Upper School, leadership all recognized the importance of building new while at the same time recognizing the role of the past. One of the challenges, of course, was that much of the original buildings were destroyed. In collaboration with Minnehaha Academy’s construction and design partners, great care was taken to preserve and commemorate the past while creating a new environment that will support students for the next 100 years. Prior to demolition, crews carefully removed artifacts from the 1912 and 1922 buildings. Some of these items will be integrated into the reimagined Upper School, others will be displayed in the Archive House. When the 1912 and 1922 buildings were constructed, cornerstones were laid as foundational remembrances of a time when members of the Minnehaha community stepped out in faith to build a place where students could learn in a Christian community. 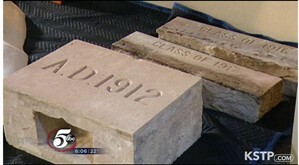 The cornerstones from a century ago will be placed in the reimagined Upper School. It will be a way for them to acknowledge how the work that began many years ago still carries on today, and will carry on years from now. Demolition crews discovered a time capsule from 1912 left inside a cornerstone in the portion of Minnehaha Academy destroyed by a natural gas explosion on Aug. 2. "We did not know, we thought, we had a hunch there might be a time capsule,” said Dr. Donna Harris, the school's president. “We are discovering treasures in our school." There were 3 time capsules found in all. 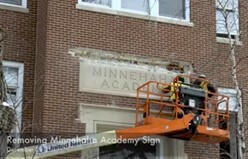 This Minnehaha Academy sign block was placed over the main entrance of the school’s first 1912 building and remained there until it was removed in 2017 following the explosion on Aug. 2. It will be reinstalled in the new building. 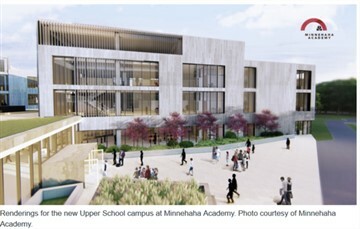 Officials at Minnehaha Academy unveiled plans for an ambitious rebuild of three buildings on the Upper School campus after a natural gas explosion killed two employees last summer. The damage from the explosion forced the school to tear down two old buildings from 1912 and 1922, as well as the building that connected them, which is where the explosion originated. The buildings will bring 100,000 feet of new space, nearly double what the school lost. All three will be essentially identical to allow the school the flexibility to decide how to use the space. The design reflects open and modern learning, not the classrooms and hallways of old. “Multi-use spaces, small, medium learning studios, flexible furniture [and] dynamic spaces where students can work on projects together,” Harris said. The new design incorporates the old space in a way that honors its absence: as a courtyard memorial space with a garden and art. The new high school angles out from there toward the Mississippi, embracing the river and the natural beauty of the landscape in a way the old buildings could not. Instead of being fronted by a parking lot and tennis courts, there’s a graceful building that allows open space and sunlight. The potential middle school addition is planned behind the existing school space to the west. It would be constructed when funding and time allow. The school shared their vision via a virtual reality tour and architect renderings. It didn’t all go smoothly however. 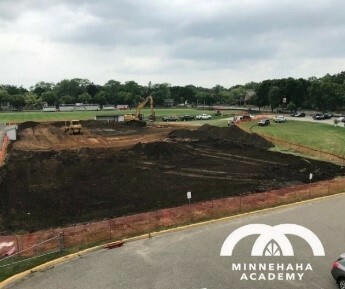 As reported in a local newspaper, (https://streets.mn/2018/05/02/a-new-look-for-minnehaha-academy/), the school is on what is called a “flash track” process to rebuild in time for the 2019-20 school year. Matching up the timelines in terms of funding, design, construction, and the school year is a challenge, especially when doing it all as a private institution very much in the public eye because of the events. The administration has been surprised at times by the level of public scrutiny. In looking at options, the school put everything on the table, including relocating the campus entirely to the suburbs. There were several permutations for reconfiguring both the Lower and Upper Campus properties. Ultimately, it settled on rebuilding at 3100 West River Parkway. When Minnehaha Academy shared its rebuilding plans with the nearby community, any regular Streets.mn reader could have predicted the outcome: neighbors were concerned about building height, the lack of a traditional brick school design, migratory birds, and, yes, traffic and parking. School officials and representatives of the firms that will build and design the new facility held a community meeting and open house. Minnehaha Academy had plans to engage neighbors, simultaneously going to the city to request conditional use permits for the additions and for increasing the height, as well as variances to reduce the front and side setbacks and to allow parking between the front lot line and the principal structure (which was the current case). Neighbors characterize their concerns about the new school design largely as being about height, but supporters point out that the new buildings aren’t higher than the old. After some negotiating the school agreed to reduce the height of the school addition from 54 to 46 feet. The other issue that has consistently aroused anger is transportation. Many brought up longstanding traffic issues before and after school and events. Despite how Minnehaha Academy draws students from across the metro area, it’s an urban school that has been in place for more than a century. The neighborhood grew up around it and has benefited from that proximity. Today, roughly 60 percent of Minnehaha students live in Minneapolis or St. Paul, and about half of those live in zip codes adjacent to the school. About half of students are currently bussed. Harris noted that the city requires the school to come up with robust plans for transportation and for communicating about transportation alternatives to families, which will be reviewed annually. A draft Travel Demand Management Plan calls for a baseline commuter survey in the first year and then every two years so that adjustments can be made as needed. Many neighbors and community members also raised concerns about migratory birds. On September 7, 2018, the school announced that Bird-Safe Window Glazing will be added to the design. Each glass window facing the river will include 1” thick horizontal line patterns. This type of treatment is called “fritted glass” and is structured to help birds realize the building is solid rather than a transparent window. – confirmed Mpls. Mayor Frey in an address to an audience at the Aug. 2, 2018 Pillar Raising event. 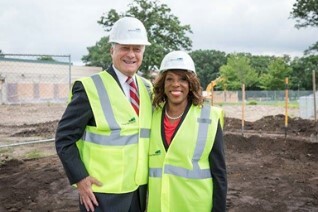 David Anderson, Board Chair & '67 Alum, and Dr. Harris visit the home of the Upper School at the 3100 Campus as construction begins! School leadership wanted to celebrate the building of the new school buildings but also recognize and remember what was lost one year before. Because of this, they delayed a “ground-breaking” ceremony and instead planned a “pillar-raising” on the anniversary of the explosion. The day was covered by all of the local media and hundreds of people attended. 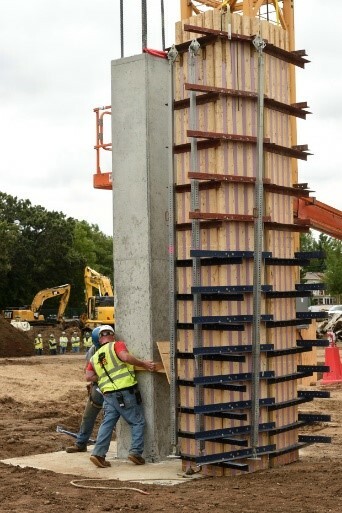 Construction workers prepare for a pillar-raising ceremony at Minnehaha Academy's North Campus in Minneapolis on Thursday, Aug. 2, 2018. Its installation helps mark a new beginning for the school since last year's fatal explosion. A few hundred people attended the ceremony. Emma Melling, who graduated this spring, was one of them. At times, she said, it seems like the school explosion happened yesterday. 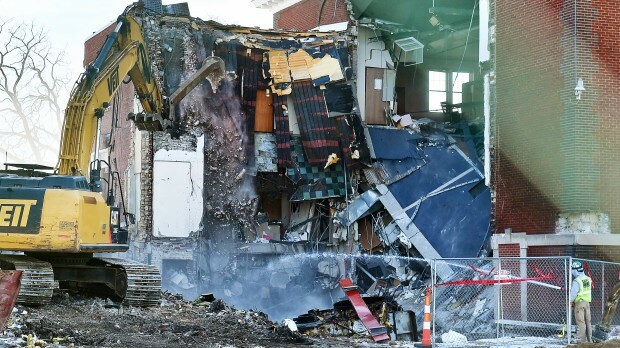 "We've all experienced the pain and trauma of the explosion, but I think we are all experiencing, as a community, the hope of the rebuild and what the next few years will look like for Minnehaha," Melling said. The pillar will eventually be surrounded by one of the main gathering spaces for students in their new school. 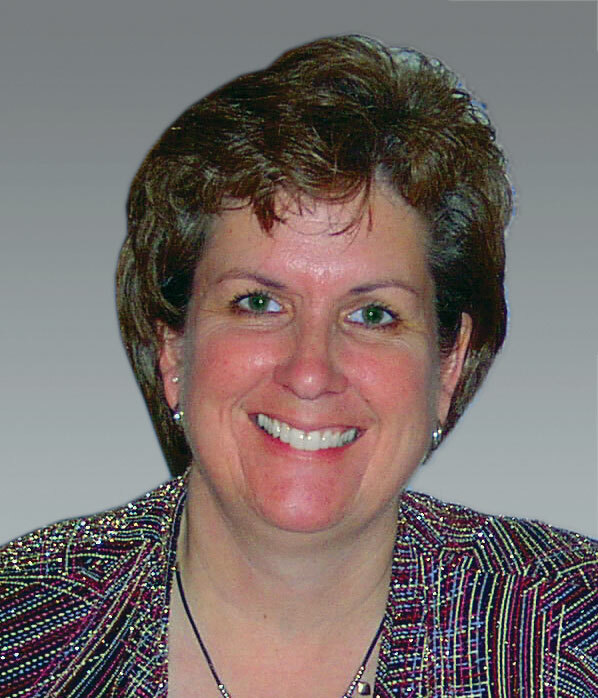 School administrators want people to reflect. "Our hearts are heavy, we are remembering our colleagues, we are remembering our loss," said Dr. Donna Harris, the school's president. But the school community is also looking forward to what comes next. "Change is a good thing, and I think it will bring energy to our students and energy to our school and our community," said Jason Wenschlag, the school's principal. 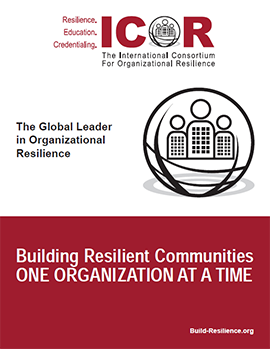 One of the strengths demonstrated by those leading the rebuild was the intentional strategy to include feedback from all those impacted by the explosion and in the future school. They identified those most interested including community members, parents, students, alumni, and staff members. 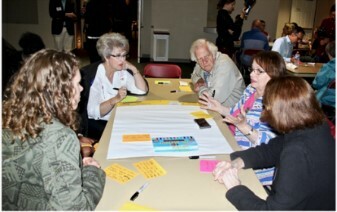 Breaking up into small groups in Watson Art Gallery, the alumni, ranging from class of 1943 to class of 2015, shared memories and considered possible ways that the school’s extensive alumni legacy could be portrayed. In November 2018 the faculty was asked to brainstorm and provide how they envisioned the new campus providing them provide unique opportunities for students to learn and grow – uncovering innovative ways they can re-imagine education and enhance each child educational experience. 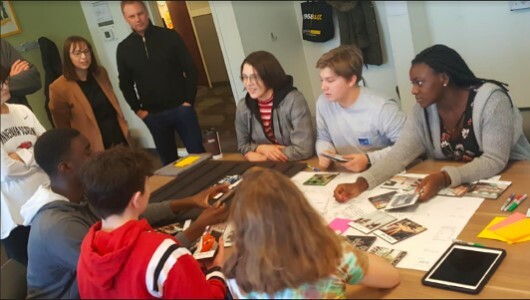 Also in November 2018, Upper School students had the opportunity to meet with architects and talk about what they would like the new campus to feel like when they walked in the doors. 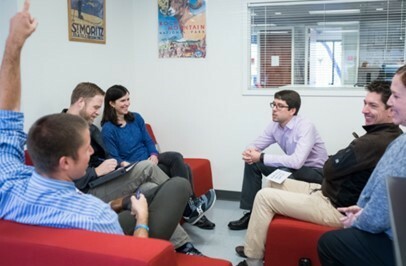 Students shared that it is important that the space is warm, welcoming, and comfortable. Students then looked at various furniture pieces and room designs and offered their insights. 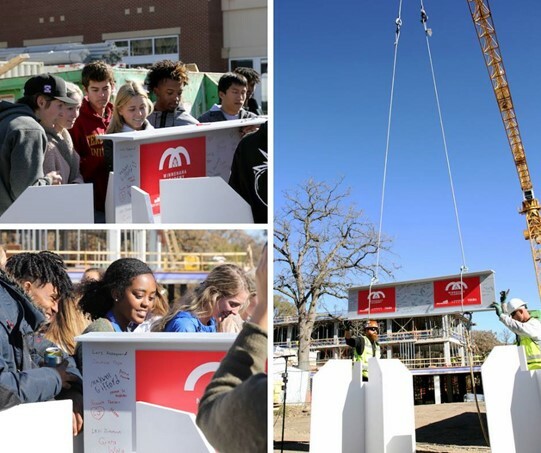 In December 2018, members of senior class and parents sign ceremonial beam - a structural beam - a permanent, visible fixture inside the reimagined Upper School. It will be a supporting beam for the large skylight in the Upper School. 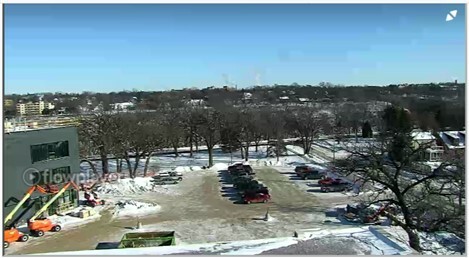 In early January 2019, specially-made bricks arrived at Minnehaha Academy. The bricks come from Denmark, where according to a Facebook post from the school, they were created by hand using the same method that would have been used to create the original bricks at the Upper School more than 100 years ago. A total of 44,000 bricks are expected to be used in the project. 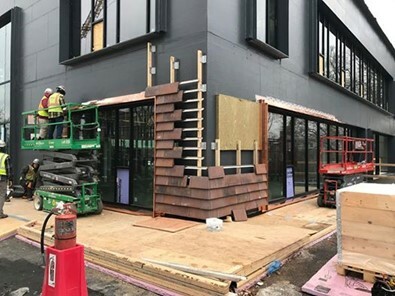 Crews are now beginning installation at the reimagined Upper School at 3100 West River Parkway in Minneapolis. Because this shingle brick is mechanically fashioned without mortar, construction workers did not have to build a temporary enclosure to maintain temperature for the mortar, allowing installation to happen during the winter. 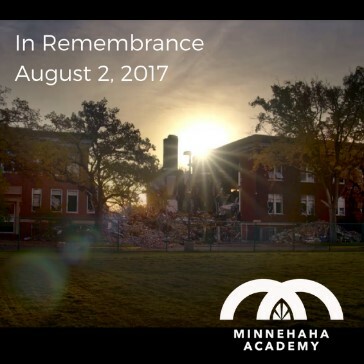 The last blog in the Minnehaha Academy Journey will be published in August 2019 when they open their doors for the 2019-2020 school year at their new school.